During the first few days and weeks after your get new dentures, your mouth will need to adjust to your new appliance, and you’ll have to eat a soft diet for a while. Here are a few food suggestions to help you avoid getting bored! 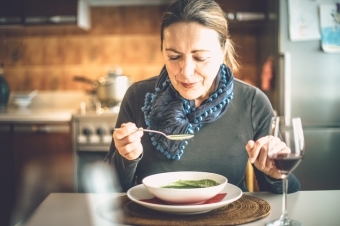 During different stages of the denture process, including the first days after your extraction, and then after you are first fitted for your new dentures, you will have to subsist on a diet of soft or liquid foods. But don't worry, it doesn't have to be boring! You can plan ahead and have a variety of interesting meals and snacks at home and ready for you during this uncomfortable time. Spend some time cooking and freezing your favourite soft meals, doing some meal planning, and making a couple of trips to the grocery store to stock up on supplies. Particularly if you have to have teeth extracted, or have to go for a time without teeth as your dentures are prepared, you may not feel up to going out too much. Having lots of options on hand will really help. Preparing ahead of time with lots of soft meal and snack options can make those first few days with dentures a lot easier. Please feel free to contact our Surrey dental office any time for more advice!